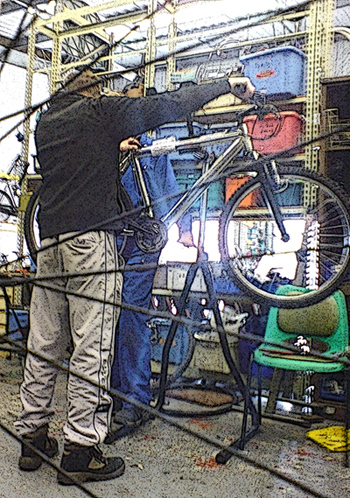 While many people know Back 2 Bikes for it's work recycling, selling, and repairing bicycles an important element of its work is helping the unemployed gain skills which they can use to help them find work. Back 2 Bikes therefore encourages and supports unemployed volunteers to work alongside its full time staff to gain new skills. Volunteering opportunities are available to both men and women in a number of areas, not just in the workshop repairing or recycling bicycles. There are also opportunities in office work, retail sales, and in IT and online sale support. While having an interest in bicycles would be useful this is not a requirement. What is more important is the desire to gain skills to help you find work! If you are unemployed and interested in doing some work either give us a ring or drop in and have a chat. While we try to take everyone who wants to volunteer with us it may be necessary at time to add potential volunteers to our waiting list.